At this point I decided to submit a complaint to Dover District Council Professional Standards Department about the way in which the planning department had processed my planning application. After I had submitted this formal complaint on the 29th August 2005 it was merely passed to Mike Dawson, Chief Planning Officer (CPO), whose response did not deal with the concerns I raised. Given that my complaint related to matters that fell within the remit of the Planning Department, including factual inaccuracies in their planning report, was it appropriate to give it to the head of that department to investigate? Clearly Mr Dawson could not be considered impartial in this instance. I subsequently wrote to Nadeem Aziz the Chief Executive (CE) of Dover District Council expressing my concerns and he then referred my complaint to Mr C.J. Grieve on 22nd September 2005. At this time Nadeem Aziz assured me that after my complaint had been investigated, Mr Grieve’s final report and his findings would be binding and could not be altered. But the CE was not true to his word because he did ultimately attempt to coerce Mr Grieve to change his published report. Mr Grieve was a Professional Standards Investigator and Accredited Mediator, formerly a Chief Superintendent with Kent Police. He was an external investigator although, in practice, a salaried officer of Dover District Council but he operated outside the Council’s normal management structure. Mr Grieve expended some 200 hours thoroughly investigating my complaint and his findings were published in a report dated the 6th May 2006. During the course of his investigation Mr Grieve interviewed Michael Dawson the Chief Planning Officer, Tim Flisher the Development Control Manager (DCM), Nikki Coles the Principal Planning Officer (PPO) and Lee May the Council’s then Assistant Solicitor. In interview the DCM and PPO confirmed that the Council’s planning report relating to my application was more comprehensive than most planning reports but given the extensive and sensitive history of my property it was felt necessary to provide the Planning Committee with as much information as possible. However, in spite of this declaration by Tim Flisher and Nikki Coles to provide as much information as possible, they chose to remain silent on fundamental evidence and withheld the important and crucial fact that my property benefited from over sixty years of lawful residential use. This was done in full knowledge of documents held and amounted to deliberate suppression, which meant the planning committee would have been denied access to the full facts. It is also evident that Tim Flisher and Michael Dawson obstructed the investigation at the stage where Mr Grieve needed to consider the historic and dated events of my case. Tim Flisher and Michael Dawson stated that consideration of those matters was outside Mr Grieve’s remit and by implication amounted to an abuse of process. This attempt at concealment and to remain silent on crucial evidence was made in the full knowledge of documents held but Mr Grieve disagreed with their view and continued to investigate the historic and dated events anyway. From that point on Mr Grieve’s investigation led him to find Dover District Council guilty of maladministration with injustice on a number of counts. Some relevant quotes from his report are listed below. 4.1.19 The evidence of inaccurate and misleading advice was to be found within the letters from neighbours and in the Planning Inspectors finding in 2000, these documents being within the Councils possession at the time the planning report was written. (The ‘inaccurate and misleading advice’ which the Investigator is referring to, is that fabricated by the Planning Department and presented in their report to the planning committee. The evidence given by all the neighbours and the Planning Inspectors finding in 2000 confirmed that it was ‘inaccurate and misleading advice’). 4.1.20 It is my view that the Planning Report should have clearly and unambiguously identified the inaccurate and misleading advice and statements contained in the earlier documents and not simply restated them as fact. 4.1.21 Moreover, it is my view that the report was written in a style that presented the Council in a very favourable light and in so doing presented the complainant as being troublesome and his various applications and appeals as having no, or limited, merit. 4.1.22 Whilst I view this as maladministration, the report was withdrawn by the complainant prior to consideration by the Planning Committee, and in the circumstances I do not consider the complainant suffered an injustice. 6.10 After careful consideration of all the files and documents relating to the history of this site I have come to the conclusion that the Planning Committee reached the decision to demolish the complainant’s home based on inaccurate and misleading advice. 6.13 I am concerned that the planning departments conclusions reached post 1984 were based on assumptions that were not sufficiently tested and that contemporary evidence tending to support residential use was ignored or glossed over. 6.14 The injustice in this case is significant and substantial………………. 6.17 It is evident Mr Moulder bought the property with a view to renovating it and living in it with his family. However, the renovations carried out required planning permission that was not sought prior to the work being carried out and was subsequently, when retrospectively applied for, refused. It is not for me to challenge the correctness of that view or subsequent actions, but I would make the point that the evidence shows that whilst the height of the roof was increased, the building retained its original footprint. 6.19 I am also concerned at the wording of the report as it implied that Mr Moulder had blatantly breached planning regulations and had acted differently to previous applicants. Mr Moulder’s case has always been that he believed at the time that all he was doing was repairing his residential property and that he did not require planning permission. Unlike previous applicants he was not seeking to totally demolish the property and replace it with a new and enlarged property. Mr Moulder now accepts that he made a mistake, but believes he should have been given the opportunity to return the property to the condition it was in prior to his bungalow being demolished. He states he was never given this opportunity and there is nothing in the files to show that he was. 6.20 In November 2000 a different planning inspector accepted the property had been occupied from 1928 to the time of Mr Moulder’s occupation. Mr Moulder moved in to the Oaks in June 1984 and remained in residence until the Council demolished the bungalow on the 31st July 1989. 6.23 This, in my lay opinion, (Mr Grieve has a Law Degree) was a significant and fundamental error that informed and paved the way for the enforcement actions taken in the 1980’s culminating in the demolition of Mr Moulder’s bungalow. It is my view this amounts to maladministration with injustice in that decisions were made based on inaccurate and misleading advice. Furthermore, this inaccurate and misleading information was subsequently provided to the Planning Inspectorate during the appeals process. This was also maladministration. 6.25 The question needs to be asked; ‘what would the situation have been but for this maladministration?’ On a balance of probability it is my view the planning committee might have more favourably considered Mr Moulder’s retrospective planning application supported, as it would have been, by the Council’s acceptance that the property had been used for residential purposes to the date of his moving into the property and as such enjoyed ongoing residential user rights. 6.26 The grounds provided by the planning department recommending its refusal, accepted by the planning committee and, subsequently, by the planning inspector, would not then have been available to the Council. It is my view the Council’s insistence that the property had been vacant for several decades and by implication had ceased to enjoy residential user rights was fatal to the complainant’s retrospective planning application. 6.30 It is my view the wording and style of the Enforcement Report did not present a clear and unambiguous explanation of the facts – this information being available to the planning officer at the time of the report being written. 6.31 Furthermore the report was written in a style that presents the Council in a very favourable light and in so doing presents the complainant as being troublesome and his various applications and appeals as having no, or limited, merit. 6.32 The injustice caused is to be found in the additional stress, anxiety and uncertainty that has been caused to Mr Moulder in seeking to make his case to avoid the potential loss of his current home. 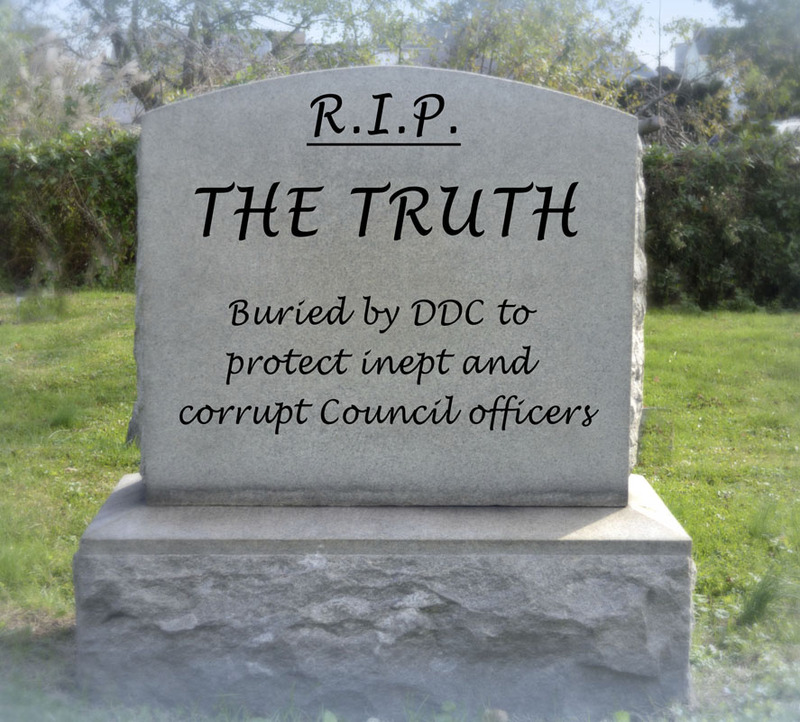 Although the Professional Standards Investigator found Dover District Council guilty of maladministration with injustice on a number of counts the Council’s Chief Executive, Nadeem Aziz, left it until the 4th December 2006, some seven months after the Grieve report was published, to tell me that no further action would be taken in connection with the investigation or, indeed, in connection with my complaint, probably because of the calamitous implications its acceptance would have for the Council. Facts do not cease to exist just because the Council ignores them! I followed exactly the procedure that the Council’s Chief Executive Nadeem Aziz advised me to take, but he hasn’t complied with his part of the agreement. It is clear that Nadeem Aziz is displeased with the honest findings of his own Professional Standards Investigator who went on ‘sick leave’ soon after the report was published, although I am, of course, not suggesting there is any connection between Mr Grieve’s sickness and the actual investigation (although there probably is). I have though been reliably informed, by Dover District Councillor Roger Frayne that Mr Grieve no longer works for the Council as a direct result of his work with my case. The Chief Executive’s treatment of his Chief Investigator is arrogant, dishonest and insulting to a man as highly qualified and respected as Mr Grieve indeed was. As the Professional Standards Investigator had upheld my complaint and therefore justified the decision to withdraw my planning application I wrote to the CE on the 19th November 2006 requesting a refund of my planning application fee. That request was ignored and I did not even receive the courtesy of an acknowledgement to my letter. It appears that Mr Aziz is only interested in perpetuating the ‘establishment stitch-up’.